Vertical Plug Spout Nozzles from Volumetric Technologies are the industry standard in dispensing nozzles. Our 2 and 3 position models are available in sizes ranging from .375” all the way up to our large 3” models. Select from a variety of options including Ertelite, Peek, or Waukesha alloy spool valves, shear edge models, and air-shot-thru piston models to aid in clean fills. Horizontal Cutoff Nozzles are the leading choice for many bakery applications that use thick, slurry-type products with or without particulates. Simple and effective with a clean cutoff, these nozzles are available in 1” thru 3”. 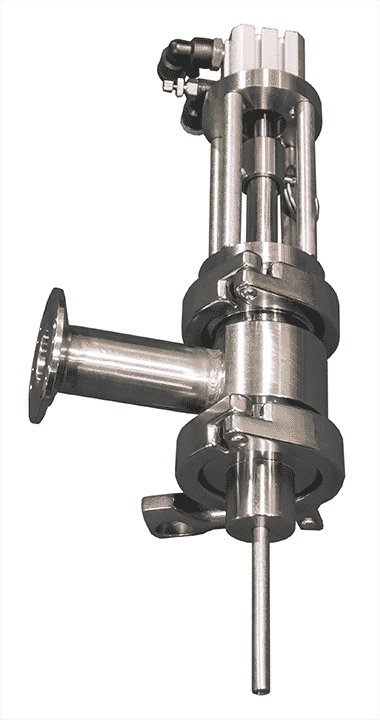 Capillary Nozzles provide drip-free dispensing of thin liquids. 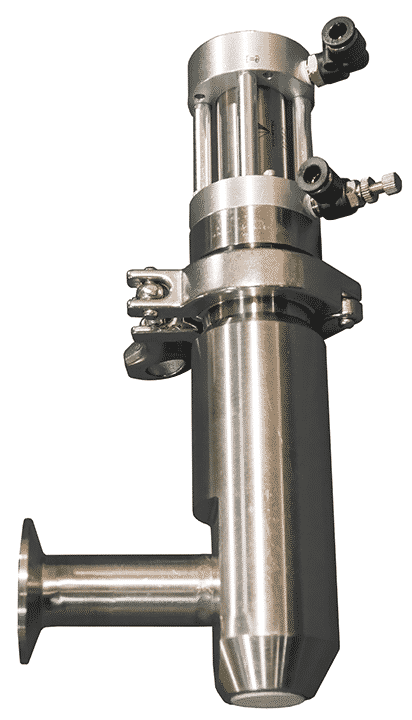 Available in single or multiple tube versions, these nozzles provide a clean laminar flow of product during dispensing and a clean cutoff. Bevel Seat Nozzles are bottom shut-off, no-drip dispensing nozzles designed for thin liquids or thick creams. They are available in opening sizes ranging from .25” to 1.9” with a variety of lengths for top filling or bottom-up filling containers. Our vertical hand held nozzle has the ability to deposit many products such as soups, marinades, batters and a wide variety of food based products. These are extremely useful for producing ready to eat meals, in bakery applications, or lab operations where you have to make many deposits accurately and cleanly. Volumetric Technologies also manufactures rosette tip attachments for these nozzles for cake and bakery goods decorating. There are many icing tips to choose from so you can turn your ideas for decorating into a reality, without the use of a decorating bag. Our vertical hand held nozzles are easy to disassemble and clean and come with a pistol grip handle as well as a finger trigger for cycle start. Design and balance make these hand held vertical cut off nozzles comfortable for the operator to use. 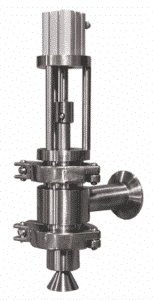 Inverted Cone Nozzles are the ideal choice for liquids, creams, homogeneous sauces, and sticky products. They provide extremely clean drip-free dispensing and a softer, diffused fill that helps eliminate splashing. Available in sizes from .375” to 1.875”. Rotary Cutoff Nozzles are a versatile style of nozzle for thick products, with or without particulates. The rotary nozzle provides a clean cutoff of the product flow, and is recommended for products that buildup such as fudge, soup bases, or products with high sugar or salt content. Available in 1” – 3” sizes. 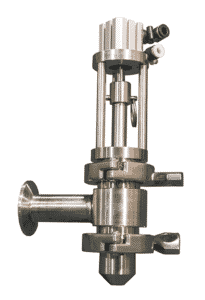 Guillotine and Wire Cutoff Nozzles are most commonly used in the meat, cheese, and baking industries with a vacuum stuffer to extrude extremely thick products such as cubed, ground, or full muscle meats, chicken, sausage, cheese, and dough. The guillotines are available in a wide variety of extruder horn diameters as well as custom shapes. Overflow Filling Nozzles are designed for filling thinner liquid products dispensed from a pressure overflow filler. 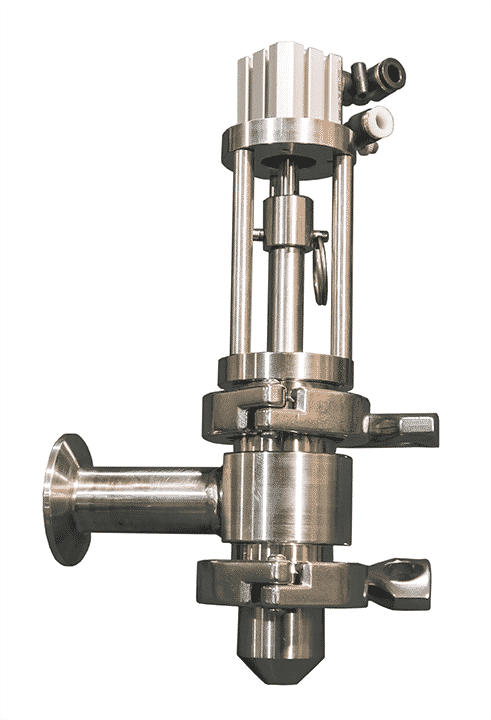 Volumetric Technologies manufactures a wide variety of overflow filling nozzles for our overflow fillers, as well as overflow nozzle replacements for other brands. Overflow nozzles dive into the container and are compressed open,allowing the product to flow through the nozzle. When the container is full, it overflows into the return line, the nozzle is then retracted and the product flow shut off. 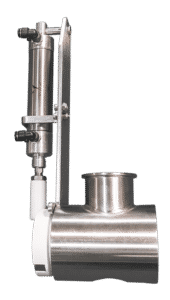 Our rotary hand held nozzle has the ability to cleanly deposit your products such as pancake batter, fruit slurry, pie fillings, cake batters, muffin batters and many other items accurately and cleanly. They are available in 1” and 1.5” port sizes, so they can handle thicker products with and without particulates. They are easy to disassemble to clean and come with a pistol grip handle as well as a finger trigger for cycle start. Design and balance make these hand held rotary cut off nozzles comfortable for the operator to use.